My earliest memories of Little Rock consist of things that were around the UAMS area in the mid-70s. I can remember the (much smaller) campus, the old hotel on the corner (pre-scary days), the sign on the paint store down Markham and the big golf course at War Memorial. And I can recall Frostop. It was a decent sized restaurant on the corner of Markham and Cedar, and it always smelled of hot beef. I can’t quite clearly recall whether the big mug was there in my earliest memories, but I do clearly recall it being there as I got older. I remembered a wax-paper wrapped burger and a birch-y root beer. Perhaps I should feel a little old -- being able to remember back more than 30 years like that. Ah, well, we all age. I think Frostop moved across the river when I was in college. I remember it was on JFK next to the Pizza Hut, and then it moved north into a former Burger King in front of Harvest Foods (now Savers). And then a short time back I saw it was gone -- and I lamented. It wasn’t gone, though. It was just moved another block up the road into a strip mall, and the old mug that had stood in front of the store was retired. It’s easy to overlook if you don’t know what you’re looking for. I have to admit, it had completely fallen off my radar until the World Championship Cheese Dip Competition. 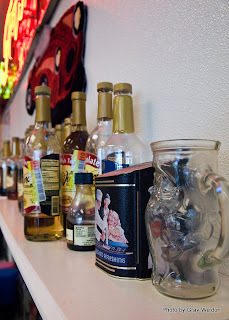 It was after the competition had ended -- I’d eaten way too much cheese dip and wanted some liquid refreshment. I don’t know what imprinted the idea in my head -- maybe a conversation, who knows. I just know it came to mind when Grav and I were looking for some place to grab a beverage. We ducked into the little red-clad dining room. 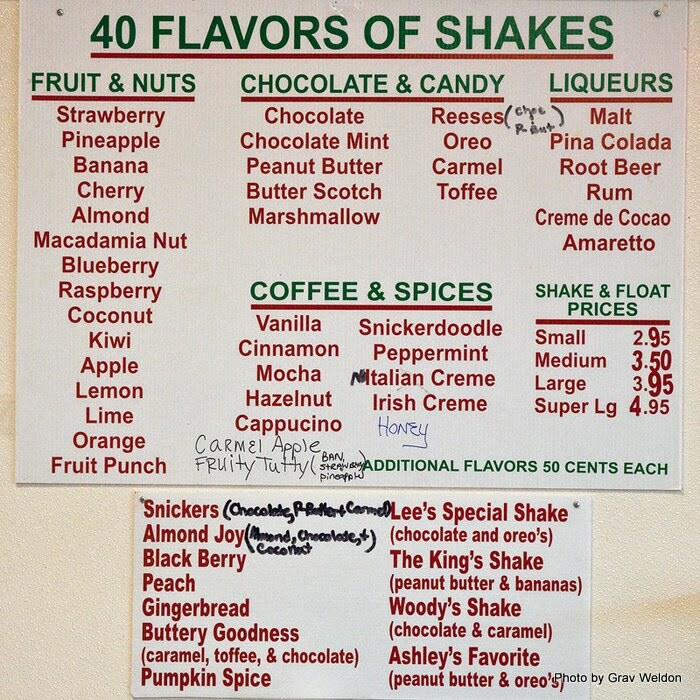 Grav got a Mountain Dew and I had a Snickers shake, trying hard to get the gooey cheese-filled feeling to subside. We sat down and went over our shoot schedule for the week. One of the ladies working that day had overheard us talking about the menu. I hadn’t remembered gyros being offered, but then again all I’d ever eaten then was the burger. She brought out a sample of the gyro meat. It was pretty good, but we were so out of it neither one of us could get into a review. And we’d left cameras in the car. I did promise Grav I’d bring him back over when he came back into town again. Took a month, but we had one particular day where we both did television (KARK Today at Noon) and radio (Dave Elswick’s show on KARN) and needed a break in-between. 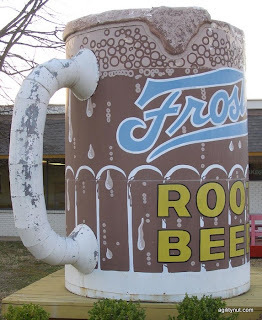 I hauled Grav over to Frostop and insisted he had to order the root beer -- and if it was non-carbonated and he griped about it I was going to be irritated. I was kidding. Mostly. We stumbled in and stared at the menu, still trying to get over the natural adrenaline of being on TV. Grav had to try a gyro. I took a little longer but settled on a crab cake sandwich. Our hostess took a couple of frosted mugs out of a freezer and pulled us a couple of root beers. We went to sit. There’s just something fabulous about a frosted mug. The outside of the glass gets that great frosty glaze. 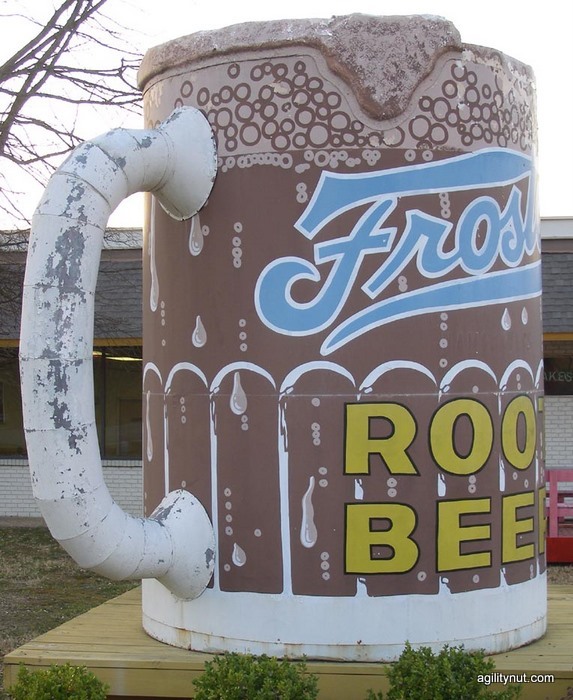 Inside, everywhere the root beer touches becomes a soft layer of root beer flavored ice. 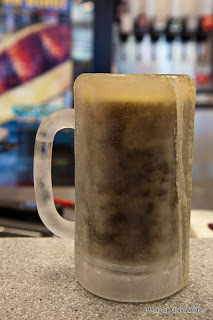 Pieces of that ice break off and rise to the surface of the root beer, giving it an icy head that’s just amplified by tiny carbonation bubbles. The flavor is bright like a bitterly cold winter’s day, not all that sweet or cloying but clear and a little woody, even a little astringent. The beverage smells of sassafras and sugar. It’s hard not to down the entire mug at once… even though the carbonation threatens to unleash an avalanche of belches, the infusion is light and goes down smoothly. Refills, by the way? They’re included. 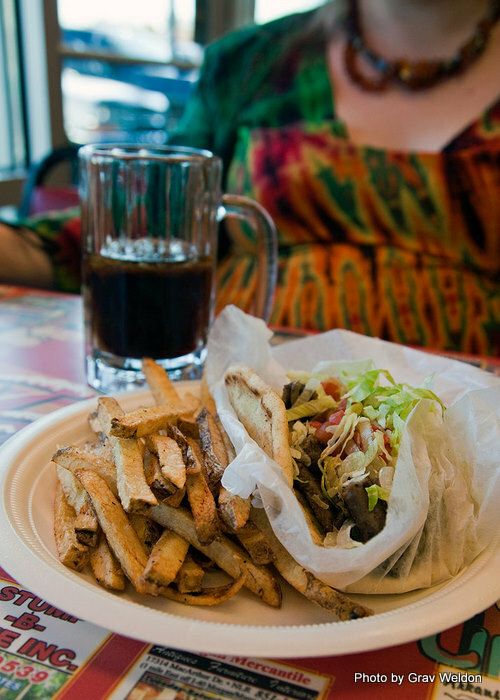 tzatziki sauce, a golden toasted pita filled with meat, tomatoes, onions and lettuce. The meat was a little different from a regular gyro, much beefier and with a different sort of seasoning from what you get at Layla’s or Ali Baba’s. After a minute, it came across. And you know, he was right. I hadn’t, either. It was odd, maybe a bone to the American crowd that came through. Not that it was bad, it was just unusual. My crab cake sandwich was delivered a few minutes later. The cakes were very hot, New Orleans style with white lump crabmeat, bits of celery and onion and ample breading. There was one crab cake on each half of the sandwich, under a roof of soft Po’Boy roll with lettuce, tomato and remoulade. The sauce gave it a nice tangy kick, and the crab cakes themselves were really filling. I appreciated that each half of the sandwich was wrapped in wax paper, because knowing me I’d have ended up with remoulade in my lap. The fries that came with our meals were done the right way -- brown instead of pungent yellow, crispy on the outside and soft within. They’re spiced well enough to be good on their own, but I found them to be excellent ketchup-bearing fries, nice long sturdy strips thick as those fat kid pencils you get in elementary school. Each of our “value meals” (sandwich, fries and root beer) were $8.95 -- just a bit more food than we could eat but plenty for the money. 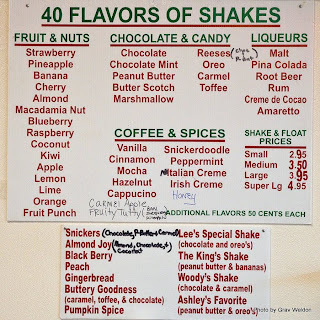 I was tempted when I originally ordered to get another one of those shakes, but by the time we were done with our meals I had completely lost interest. Just too full. I’m not sure if there are any other Frostops in strip malls anywhere. The chain itself folded in the 80s; the Frostops that remain (mostly in Louisiana and around the Great Lakes area) are all independently owned and operated. 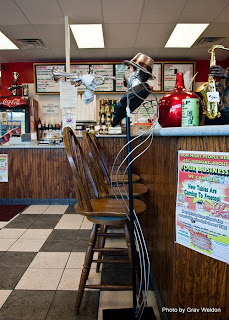 I wonder if North Little Rock’s Frostop is the only one to serve gyros. Maybe. Been meaning to go back, too… not only to do a proper burger review but to take advantage of the offers that keep ending up in my email box… right now I have one that says “Free Cheese Sticks from Joe Garah” I want to use. I get offers about once a month like that, because I signed up in the store for updates through email. You can, too. Of course, I have so many restaurants to cover that it’s hard to get back to any one place -- but I’m gonna try. 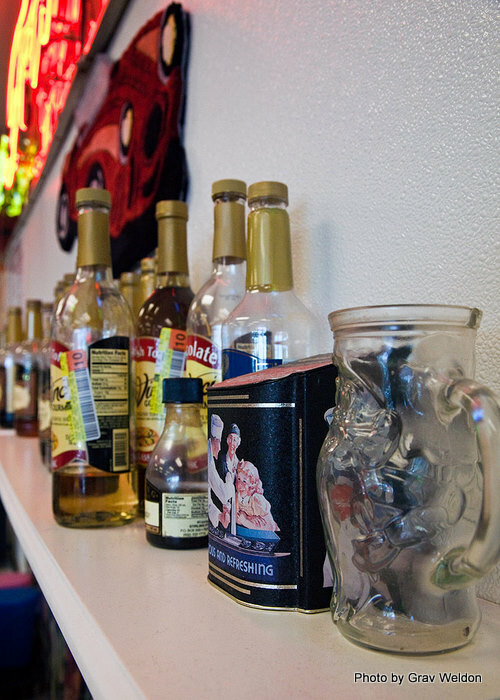 You’ll find Frostop at 4517 JFK Boulevard in North Little Rock. It’s open 10 a.m.-9 p.m. Monday through Saturday and noon to six on Sunday. (501) 758-4535. Frost Top has (IMHO) the best burger in the area. I think they use some of the Greek seasoning and the hot griddle gives a slight crust to the meat. The fries, when fried extra crisp, are awesome. 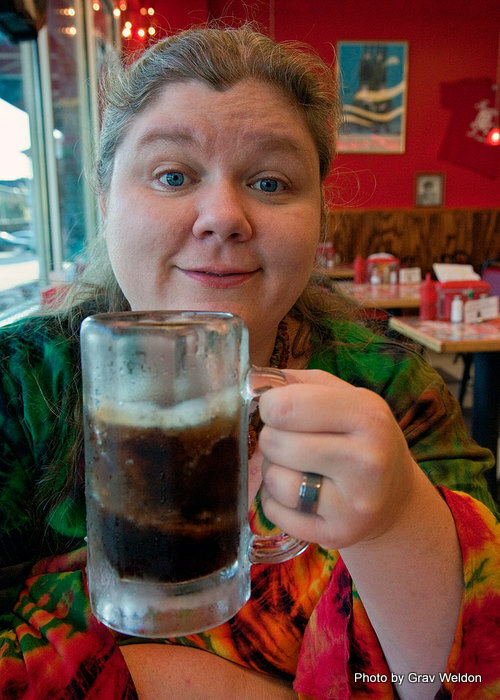 And, of course, the root beer is a must-have.